.hack//Infection (PS2) Review - Game Reviews | Squackle.com! The Funniest Site on the Net! 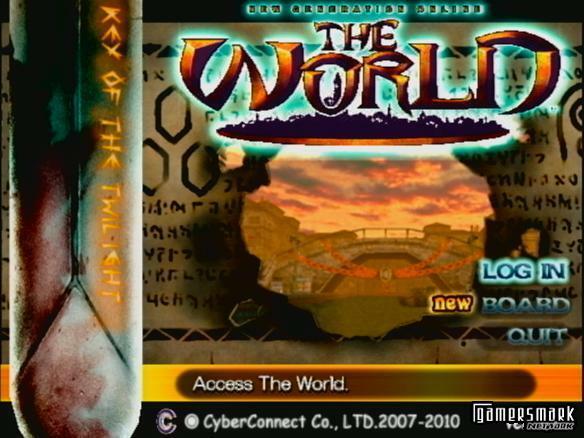 Part one in a series of four games, .hack // INFECTION takes place in a simulated MMORPG (Massive Multiplayer Online Role Playing Game) called The World. What .hack manages to accomplish, is give the feel of playing online, with the ability to trade with other players, explore many different areas, and go on assortments of different quests, in addition to plenty more. Your allies even act as their own independent player (for the most part), like they were being controlled by another player, playing alongside you somewhere else in the world. The main difference from .hack and an MMORPG is that there is a structured story, with characters in the game that you’ll encounter repeatedly throughout its tenure. If you don’t like complicated games that take a long time to get into, this is probably not your game/gaming series. There is a lot to learn about .hack: weapons, shops, and areas in the World, Altimit (your simulated computer’s operating system), and more. As you progress through the game, more is added on, and that’s only half the game. A big part of the game is the story. The whole time you’re trying to figure out what the heck is going on, and just when you think you understand what’s going on, a bunch of random occurrences are tossed at you, confusing you even more, as well as enticing you to buy the next game in the series. The graphics are great. There’s nothing to say bad about this game graphic-wise. For the most part, you can easily define something that is of interest from the scenery, and it’s easy to tell whether or not something is an enemy. There is constantly a myriad of colors for you to submerge yourself into. During battles, there are different colors flashing, things coming out of the ground, and things flying out of the air, all summing up to be a nice blend. The game’s frame rate almost never slows down, unless you have a horde of enemies unleashed at the same time. The only unfortunate thing is how there aren’t any CG movies. There are movies, but they are usually done with an in-game sort of feel to them, not looking any different than what it does in-game. Something you don’t see in 99% of the games out there is that there are two different language settings. Some people don’t like to hear their games in English, so they can switch it to Japanese. I don’t like to hear the Japanese banter and having to read the text boxes in order to understand what’s going on, so I leave it on English. This will appease some of the whiners out there who wish that all their games are in Japanese instead of English, I suppose. Practically every time you talk with another character, there is a voice that accompanies it. The only time you’re not going to get voices are when you talk to the people in towns you trade with. So, I guess by this time you’re asking “how good is the actual voice acting?” Well, it’s some of the best that I’ve ever heard. There are some annoying voices I’d rather not listen to, but I just don’t use those characters, and that basically solves the problem. The musical score is definitely a well made one. Certain songs do get redundant because you visit certain areas which use the same music over and over. Certain examples would be dungeons, and root towns. You spend almost the whole game in either one of them, so you’ll begin to know the music by heart. All the fighting is done in real-time, and in full 3D. You can pause the game to request abilities that your allies have, or to use one of your abilities, but its basically non-stop action once you get into a battle. An interesting part of the game is called Data Drain. Throughout playing .hack, it will keep reminding you that The World is a game inside your game, and this is one of the reminders. Data Drain is the ability/virus that rewrites an enemy’s data, and makes them into a weaker enemy. Every time you use Data Drain, you also obtain a rare item. It’s a great help at times, but if you use Data Drain too much you run the risk of having the viral infection in your character to spread enough that it can take away experience points, give status problems, or even kill you. Don’t ask me how that happens, it just does. The reason you have the ability in the first place, is because you have a bracelet that no one can really see. The bracelet was given to you by some girl named Aura at the beginning of the game, and when you complete this game, you still wonder who she is. I’m not expecting to find out who she is till Part Four. Allies are a big and very essential part of the game. When you defeat an enemy, experience is not divided between allies, so you may as well have allies going along with you when you’re out in an area. Allies can help you out with healing, fighting, and special abilities. They even take care of themselves, buying items they’ve used during battle when they go back to town. The only downfall is that your allies have to be sort of babied. You have to constantly look out for them, and hope they’ll heal themselves before they die, resulting in the use of an expensive resurrection item. In addition, you also have to give them weapons, armor, and accessories so that they can actually help you in battle when you get to the higher levels. You have to be very careful, because if you give them an item you didn’t want to give them, there’s no way to get it back. Interacting with people, roaming the towns, and using the shops is a big part of the game. You usually can’t get very high levelled weapons at the shops, so that’s why you need to trade with the other players of The World. It’s a shot in the dark whether or not someone is going to have something you want, but when they have a weapon or a piece of armor that is obviously better than one you or an ally has, you’re going to want to trade for it. Most of the time it’s definitely in your favor when it comes to trading, but to get some of the very highly leveled weapons/armor, you won’t get them unless you trade rare items (or fairly hard to obtain items) for them. There is only one town per “server,” so you get to spend a while at each town before you get to go to the next one. A portal, called the Chaos Gate, is in every town. The Chaos Gate is used to send you and your allies to an area in The World. Each area is made up of three different keywords, each influencing the kind of area it will be. This gives the possibility for a seemingly endless amount of areas to go to, and going to the same keywords on a different server is going to be different as well. There’s a long list of keywords as well, and if you wanted to go to an area to level up, you can choose to put together random keywords. The backend system is useful and very easy to understand. You can get used to it in almost no time at all, but there are certain restrictions you’re just going to have to live with. Like other MMORPGs, you have a limited number of items you can carry at any one time. So, the makers of The World have generously given you ninety-nine extra slots for distinct items (not multiples) at a place easily accessible in the root town. You aren’t able to use these in battle, however. You’re only allowed to have thirty distinct items at your disposal. It’s a good idea to keep it to the bare minimum, because when you go to an area through the Chaos Gate, and go through a dungeon, you’re going to get a lot of items. Skills and abilities are fairly important as well. Unlike most RPGs, you don’t keep obtaining more and more skills to have all the time. The skills you have depend on what weapons and armor you have equipped. In general, it is simple to figure out what weapons/armor are generally better than others, because each has a Level designation. Sometimes a Lvl: 27 armor may be more useful to you than a Lvl: 32 armor, because of the abilities the Lvl: 27 weapon has. If you don’t care to have that certain ability, and would rather have the higher attack, you’d most likely go with the Lvl: 32. Another part of the backend system, which is indirect, is the operating system Altimit. 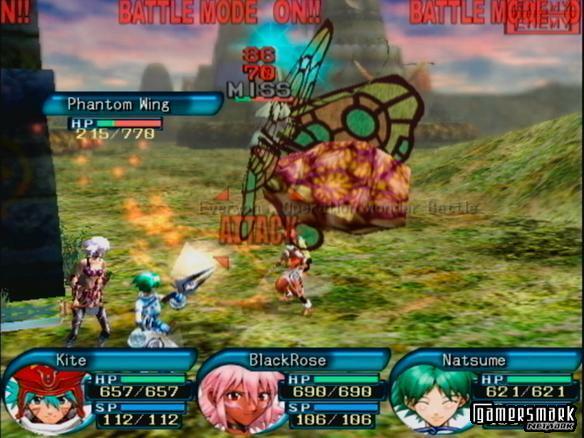 Everybody in the “real” world of .hack uses Altimit. With Altimit, you can read email and read news about what’s happening away from The World (because The World is just a game, after all). You find out a lot about how The World has made a few cases of seizures and comas through the news site (basically the whole reason why you’re playing this game, is because your friend Orca was one of these victims). There’s also a “bulletin board” type feature for The World, which answers questions people would actually ask on a help board for a game. This is basically the developer’s clever way of integrating an FAQ into the game. Parts of the story unfold on the bulletin board as well, and you find out areas that require your visiting to progress the story, or just to obtain rare items/allies. 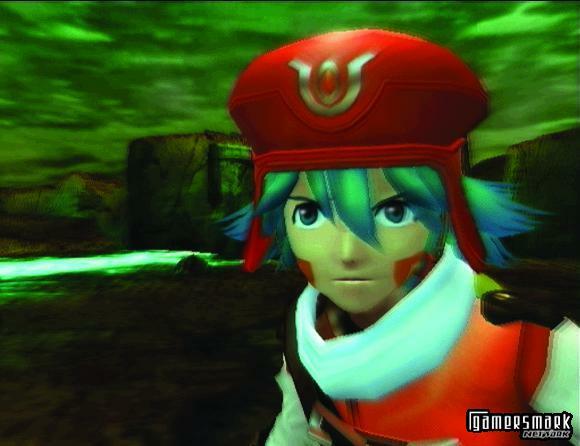 .hack Part 1 is a fairly short game, clocking in at around thirty hours. Personally, I beat the gane within two weeks. It’s a fairly aged game, so it was only $19.99 when I bought it, not $49.99 like Part 4 is currently. Even though its thirty hours, there ARE 4 parts to this game series. If each game is at least thirty hours, that’s 120+ hours of .hack fun. If you’re interested in this series, it’s probably a good idea to start with Part 1, as you’ll be able to understand the story, how to play, and be at a sufficient level to be able to play the other parts. 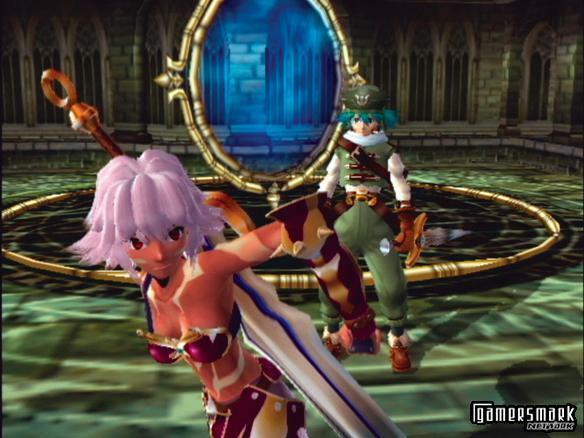 In addition to a great game, you get a free 45 minute DVD of .hack // LIMINALITY, which is exclusive to the video games. It gives another insight into the world of .hack, and how it influences people outside of The World. Stop reading and go get .hack // INFECTION.